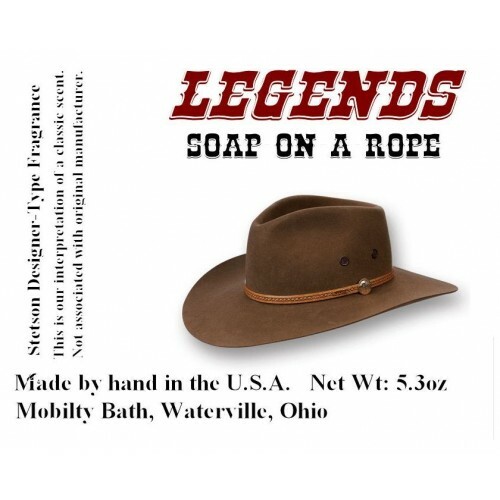 If you are one of the millions of people who love the Stetson fragrance by Coty, you won't be disappointed with the designer-type fragrance in this great goats milk base rope soap! This clearly masculine fragrance is a refined, oriental, woody scent possessing a blend of rich, woodsy, citrus spices. Since these rope soaps are handmade, supplies are limited. We occasionally run short during the holidays. If inventory is listed, order now. NOTE: *All designer fragrance "Types" are trademarked names and are the exclusive property of the manufacturer.The Stetson brand is the property of the Coty design house and is not associated with this product. The name is mentioned for comparison purposes only. Made by hand in the U.S.A.